According to Wikipedia, we know that the Water Weird was invented by Ernie Gygax because he gets a credit for it in the Monster Manual. I can find no such credit, but I see no reason to doubt the claim that he invented the monster. As for its inspiration, I haven't a clue. Its strange mechanics make it less of a monster and more of a trap, but I don't know of any "enchanted water that will reach out and pull you in to drown you" precedent. It might be an original invention. 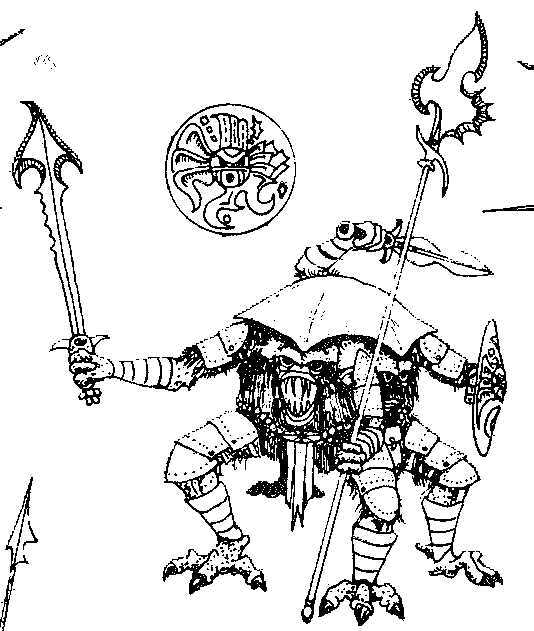 The Wind Walker seems incredibly similar to the Aerial Servant and Invisible Stalker, being a third type of invisible extraplanar being made of air. The only real difference being that these ones are free-willed whereas both the former are found when summoned by a spell caster. Needless to say, my guess is that they have a similar origin in aerial spirits (or Ariel spirits!) of story and folklore. I really haven't a clue here. With its radial symmetry and three legs I'm not sure of anything resembling it. Something about the look of it screams pulp sci-fi to me, so I'd not be surprised if there isn't some Amazing Stories short story or something like that with a similar creature. Any ideas? We're on firm ground here, again. The Yeti is a humanoid or possibly simian creature rumoured by local folklore to live in the Himalayas. The name "Yeti" is Napalese and means "snow man" in that language, but it seems to be descended from the Tibetan word "Yache" - which means "rock bear" or "cave bear" - so there is a good chance that the idea of them being near-human is due to a transliteration/translation error. According to Wikipedia, they have quite a few alternate names in the region, such as "man bear", "wild man", "cattle (stealing) bear" and "jungle man". Given all the other cases we've had so far of real creatures being exaggerated into monsters, I'm pretty sure that the yeti is basically just the Himalayan brown bear, (which, like many bears, would sometimes have been seen on two legs). In fact, the bits of "yeti" fur that have been analysed have been shown to be Himalayan brown bear fur. D&D's treatment of them has them as fierce and carnivorous, with white fur that lets them be camouflaged in the snow; although the ones from stories and supposed real-world sightings tend to be shy and have darker hair, just like the abovementioned bear. The xorn seem to bear a passing family resemblance to Lovecraft's Elder Things from At the Mountains of Madness, although those have five of everything around their bodies (much like starfish) rather than just three and also differ in other details, such as being tough and near-immortal but certainly not "elemental" creatures. Beyond that, I got nothing on them at the moment. Purely from the name the wind walker reminds me of August Derleth's Ithaqua, but that may already be all they have in common -- I'm not actually familiar with the monster itself and for all I know it could simply be an invisible stalker that's not currently bound by magic. I did think of Elder Things as being about the only radially symmetrical aliens I could think of. I also thought of Pierson's Puppeteers as being three-legged aliens - but neither seemed close enough to be a clear inspiration. I hadn't thought of Ithaqua. Other than the name, there doesn't seem to be that much in common, as you say. To be honest, we don't get much information about wind walkers other than combat statistics. There's not really anything about their habits or society or personality or anything like that, so there's not much to go on other than "another invisible air spirit". It's something of a stretch but it did pop into my head when pondering the water weird. Ernie gets credited with the water weird in the Preface of my copy of the Monster Manual (2nd edition, May 78). What's weird about Weirds is that in third edition they went in a completely different direction with them, turning them into oracle like creatures that resemble a woman made of one of the four elements coming out of their pool. If I remember right, the Xorn's six-sided design was basically copied from a race from Empire of the Petal Throne. The rough equivalent in D&D to the Paracelsian gnome would be the pech, I suppose, as it’s described as being more or less a gnome composed of elemental earth. Or maybe the Galeb Dhur? I like pech, because that way you can do a nameswap. From now on, pechs are called gnomes, and gnomes are called pechs. Spread the word. Ahoggyá do have the tri-radial symmetry, but share no other particulars with Xorn. If the former inspired the latter, it was in the same manner that plastic toy inspired the Bulette: as a visual starting point. It is a play on this: https://en.wikipedia.org/wiki/Wyrd and I prefer the oracles to a critter/trap.